One of my favourite things to do in the Summer is spend some quiet time on the beach. I love tanning and swimming in the sea, and in order to protect my skin I always use sunscreen. Earlier this summer I was running low on sunscreen, so I needed to get a new one. After trying out the Garnier Ambre Solaire Clear Protect+ SPF 50, I had sorted out my new purchase for my body. But being acne prone and having oily skin means you cannot use just any product for your face. So I began searching for a facial sunscreen. 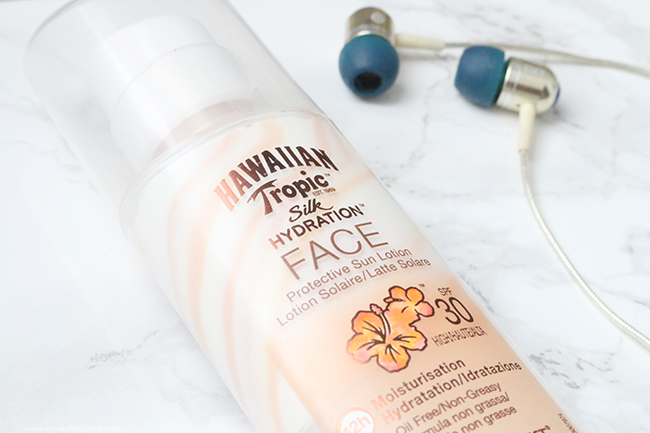 After a very long time in the Sunscreen aile, I settled on the Hawaiian Tropic Silk Hydration Face Protective Sun Lotion. The product comes in a bottle with a pump, and I love the way it is swirly on the inside. This facial sunscreen applies smoothly on the skin and absorbs very quickly. 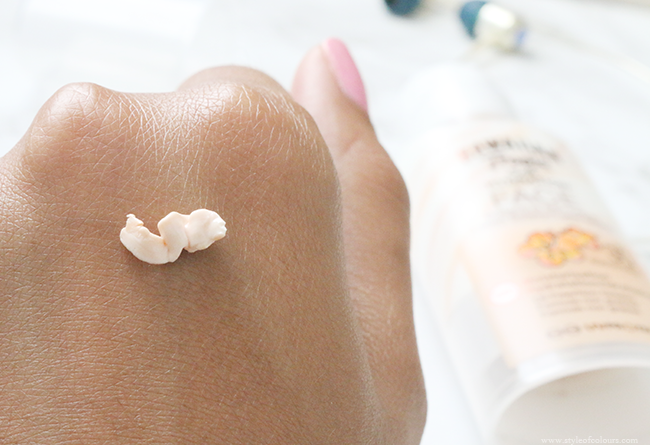 It is oil-free and lightweight, which makes it perfect for oily skin. 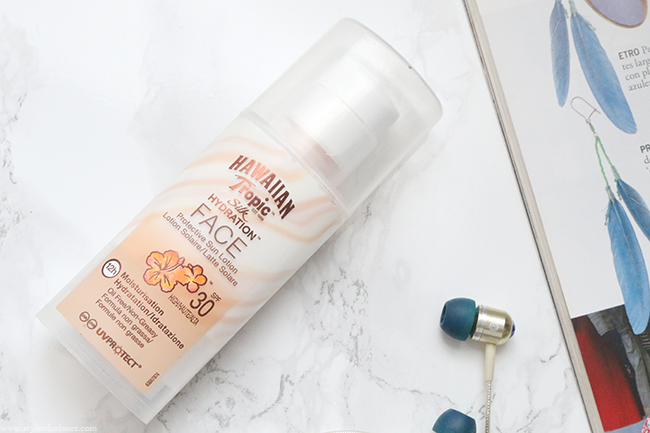 It has an SPF of 30 which I think gives enough protection from UVA and UVB rays. The packaging says it is water resistant, but I always tend to reapply after a swim. I've been using it every weekend I go to the beach and I love it. Although I would have preferred if it gave a bit of a matte finish so my skin doesn't look as oily, but it's a great product either way. It didn't cause me to breakout or have any other skin reaction so I would say it is great for acne prone skin or sensitive skin. If you are acne prone like me and have any recommendations on what sunscreen you use for your face, please let me know as I'd love to try out some new ones. I've heard the Murad Anti-Aging Moisturizer and the Neutrogena Clear Face Sunscreen are quite good but I'd love to know your thoughts if you've tried them. And if you know of any that give a matte finish, that would be the best. Likes - absorbs quickly, isn't greasy. Dislikes - doesn't have a matte finish. What sunscreen do you use for your face?